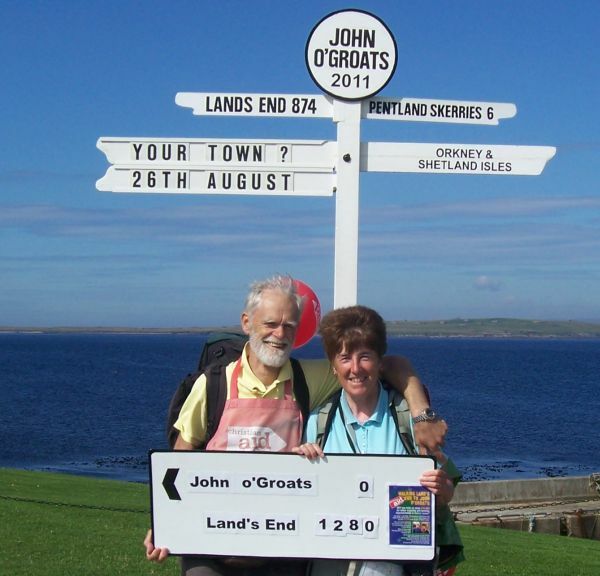 John and Nancy’s LEJOG walk has now reached the final total of £15,000. With the match-funding that the European Union will add to their figure, an overall sum of £65,000 will be released for development work in Sierra Leone. They wish to thank everybody who contributed in any way at all to this extraordinary effort and to assure them that their support and generosity has been hugely appreciated. Nancy has been interviewed about the LEJOG walk by Branch FM, a Christian radio station based in Dewsbury, West Yorkshire. The interview will be aired on Barney’s Bigger Breakfast on Thursday 8th September, probably at 9:30am. You can listen live on www.branchfm.co.uk or locally on 101.8FM. The interview may also be aired on the Round and About Show which airs: Wednesday 7th September 12-2pm; Saturday 10th September 7-9pm and Monday 12th September 8-10pm. The York Press and The Diocese of York have both published a report about the end of John and Nancy’s LEJOG walk. Click here to read them: The York Press and The Diocese of York. In the beginning was the Word – or rather a word, as words spelt with capital letters are not allowed. 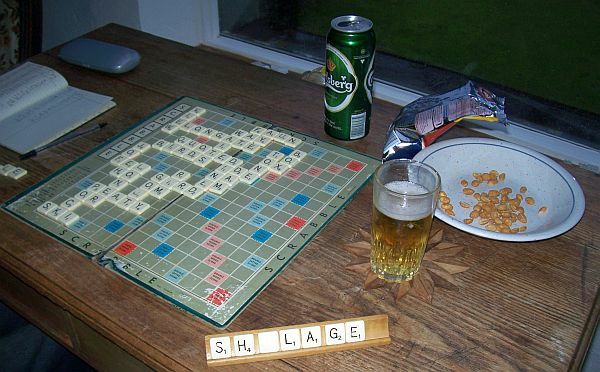 Scrabble begins with a single word. Nothing can happen until that single word is down – the pattern on the board cannot begin to be created without that first word. In our experience, Scrabble is best played by two enfleshed human beings. The rules say it can also be played by three or four people, but we have found the best games are a ‘trinity’ – him, me and the tiles on the board. The game does seem to have a life of its own. There are good boards and difficult boards. Boards which are open and those which seem closed up. Tiles which seem determined to clump together vowels or consonants and do not give the nice balance from which high-scoring words can be made. The tiles sometimes seem to be ‘on my side’ or ‘against me’. Or, it could be viewed as a nature/nurture problem. The gift of good tiles, high scoring letters, opportunities to play the ‘all-outers’ against the more demanding skill needed to make something of a mediocre group of letters. The spirit can sometimes be willing – but the concentration is weak. Scrabble can have its own ritual food. The bowl of crisps or nuts, the glass of wine or lager, can add to the experience of the interconnectedness of yourself with the game. And of course some have an experience of Scrabble which dates from childhood (like me) whilst others have an adult conversion to the game (like John). There is the fundamentalist method of playing, where the stated rules on the lid of the box are the thing you have to go by. There is no deviation or interpretation allowed. These are the rules and so you must follow them or suffer the penalties. The dictionary (Chambers) is the judge and jury of the permissibility of a word, careful attention being paid to its derivation. If the word is not permitted, then the tiles must be removed and a turn is forfeited. Once a blank is played, it remains on the table and always represents the letter for which it was originally played. There is the liberal interpretation – the blank can be ‘swapped’ if you have that letter. The dictionary can be used as a check (before playing) or even, at the extreme liberal edge, opened and browsed through to try to find a suitable combination of letters that might fit (the Sea of Browsing you might call this). If a disallowed word is found to have been played then of course the player can have another try without penalty. There are also books of Scrabble words (no meanings). These can be consulted and no requirement is made of whether a player knows the meaning of a word or not. To ‘Poxon’ means to place all seven of your letters down on the board on your very last go in a game – thus snatching victory from the jaws of defeat as your opponent is left with their own letters to deduct from their final score. This is named after a certain John Poxon who played a solid game often deliberately and quietly falling behind his wife (and John and myself) as he played but then snatching the victory at the last minute in this way – it seemed every time we played! To play ‘Scunthorpe’. This term was given to us by ‘Auntie Edna’ (now in her 90’s and a mean Scrabble player and crossword fanatic). She does not play this way herself but was forced to do so by someone else she played with. It means to play in a fundamentalist way (see above) in a mean and crabby way – if you cannot use an opening yourself you spoil it for your opponent. To have a ‘Gentleman’s’. This means if you have a lousy hand (all vowels or suchlike) and it is your turn, you can ask your opponent for a gentleman’s agreement that both of you will throw your hand’s in and pick new tiles. Of course it reveals to your opponent that you have a poor hand – but it does mean that if they also have a weak hand and agree, the game is vastly improved. But the end times (eschatology) of the contest can make or break what has gone before. It can be easy to lose concentration if your opponent (or partner in the creation of a game) is slow and you feel you are sufficiently far ahead to be out of reach. Paul did keep his eyes fixed on the goal, running towards it; and there is the saying that ‘It is not the beginning but the continuing of the same until it be thoroughly finished which yields the true glory!’ Come to think of it that might also be said of walking from Land’s End to John o’Groats! The latest of John’s Tales from End to End can be read here: The Valiant Loser’s Tale. Click the Tales tab above to see a list of all the Tales that have been collected. This week has been a gradually coming down to earth week – a time of trying to let it sink in that we have finished something big. We have travelled slowly south, seeing one or two people, who have been good enough to let us have a bed for the night. Wick – Note the shirt sponsors and prohibition! The latest of John’s Tales from End to End can be read here: The Tale at the End of the Road. Click the Tales tab above to see a list of all the Tales that have been collected. 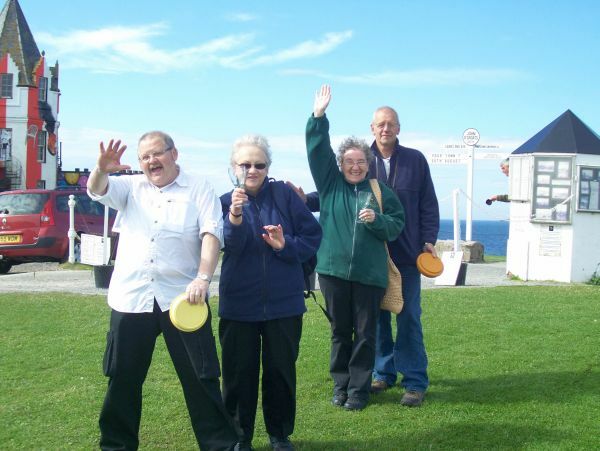 As Nancy mentioned in her most recent post, here is the video of John singing the hymn at the John o’Groats signpost. We are here – we have made it! The last 17 miles have been wonderful. The sun has shone and people have waved and encouraged. We had decided to walk the last 17 miles, from Wick to John o’Groats, in two days so that we would not be too exhausted to enjoy our arrival at John o’Groats and we were very glad that we had done that. The first ten miles went through some excellent countryside. There was a large expanse of Sinclair Bay white sand to walk along (and a stream to wade!) with views across to the lighthouse (reminiscent of Filey Bay, with Flamborough lighthouse our half way point). 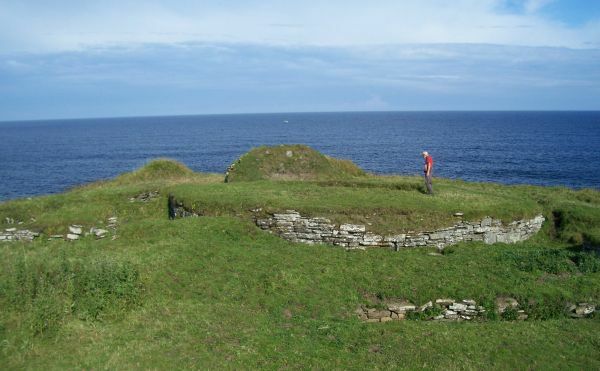 There were also ruined castles to see (two), and a ‘broch’ with a nearby Victorian monument. Brochs are iron age defensive houses found in the extremities of britain but are thick on the ground in this part of the world. They are around 2000 years old. The one we saw was surrounded by later Pictish dwellings that had recently been excavated. Our final day of walking brought us along the road which opened up so we could see the north coast from two miles away with John o’Groats in the centre and the Isles of Orkney as a backdrop. John wanted to practice his song for the end ‘Thine be the glory’ and so we sang it – and many other hymns as we walked along the road! We had a welcoming group of Esme, Stuart, Brenda, Marjorie and Duncan to greet us and a feast (see below) which covered our start in Cornwall, our origins in Yorkshire and our finale in Scotland. 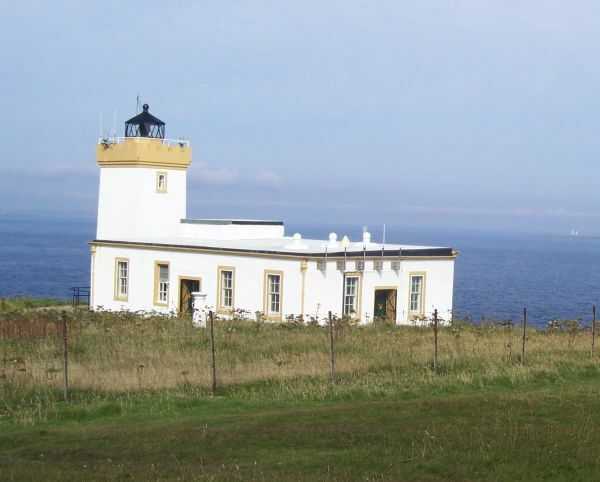 We did walk on further, after the pictures and celebrations, to Duncansby head the true most north-westerly point of mainland Britain and as we still had our advertising tabards on there were still people to greet and enquire and encourage us in our efforts! So ‘Hello and greetings’ to Lorraine in Wick stationers and her sister Debbie in Wick Tourist Information, their aunt and grandparents, Nelly and Sandy in John o’Groats Post Office, Doreen and Andi at Nybster Broch, Don doing LEJOG by public transport, Andrew waiting for his sons to arrive at John o’Groats, Esme, Stuart, Brenda, Marjorie and Duncan our welcoming party, and Julie, Callum, Tracy and Donald met at Duncansby Head. 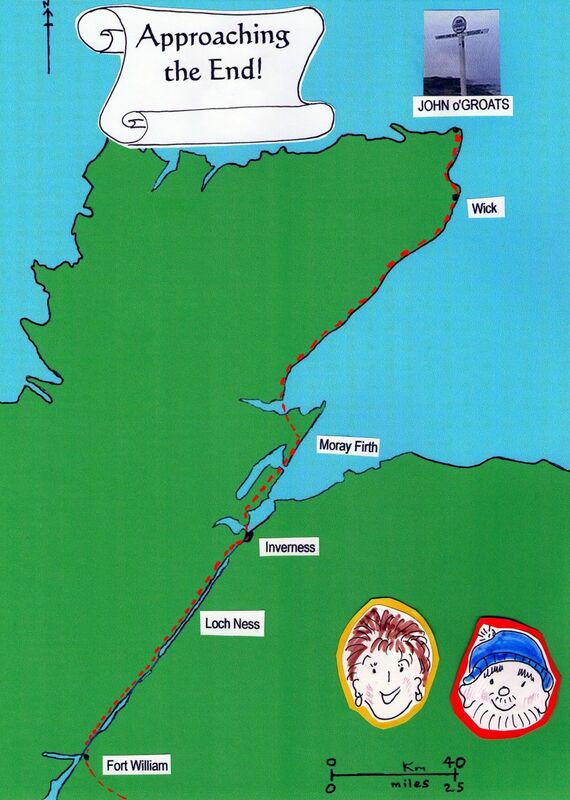 One final posting with the total statistics and final pictures of the walk will be made – don’t think this is the end! Author NancyPosted on August 27, 2011 August 27, 2011 Categories LEJOGLeave a comment on Yes! Yes! Yes!